For more information, please visit our Ferries from Malta to Sicily page. 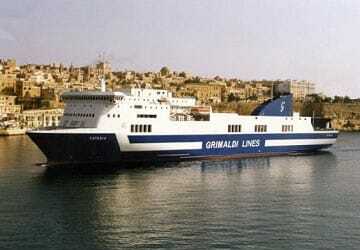 The Valletta Catania ferry route connects Malta with Sicily and is currently operated by 2 ferry companies. The Grimaldi Lines service runs up to 1 times per week with a sailing duration of around 7 hours while the Virtu Ferries service runs up to 8 times per week with a duration from 4 hr 15 min. So that’s a combined 9 sailings on offer per week on the Valletta Catania route between Malta and Sicily. Compare now and get the best fare at the time that you want to travel. Prices shown represent the average one way price paid by our customers. The most common booking on the Valletta Catania route is a car and 1 passenger. Catania is located on the east coast of Sicily on the Ionian Sea and is the second largest city in Sicily and sits under the imposing shadow of Mount Etna, or A Muntagna as the locals call it. The volcano has had a significant influence on the city's history and its actual existence, having destroyed the city on several occasions. The most destructive being an eruption in the 17th century. Catania was covered in lava in 1669 and then 24 years later, in 1693, an earthquake shook the town to its foundations. A popular attraction in the city, located on the edge of the town's square is the Cathedral which is dedicated to St. Agata, the city's patron saint. The cathedral stands on the site of an earlier 11th century church that was almost entirely destroyed in the 1693 earthquake. The imposing cathedral's baroque architectural style incorporates Roman columns taken from an amphitheatre. There are more Roman elements in the cathedral as beneath there are some Roman baths. The Baroque theme continues within the cathedral's interior with several ornate chapels and a fresco depicting the 1693 earthquake. Catania's most famous son, Bellini, is buried in the cathedral as are three Aragonese Kings: Frederick II, Louis and Frederick III.